The music program at St. Edward's sponsors three vocal ensembles who entertain audiences on and off campus. Groups include: Hilltopper Chorale (classical, gospel, and the Pops), Omni Singers (musical revue, song and dance), and the Madrigal Singers (Renaissance style). Instrumental groups also add to the musical life of our campus community. The hilltop is home to the St. Edward’s Chamber Music Ensemble, Mariachi Alas de Oro (traditional and popular music of Mexico), the SEU Orchestra, Steady (the St. Edward's University jazz ensemble), The Lab Band, The Jazz Improv Combo, the Guitar Ensemble, and the newest organization...The Pep Band. Vocal groups at St. Edward's University include the University Chorale, Madrigal Chamber Singers, Omni Singers and Omni Vocal Jazz. There is also the Masterworks Singers, which is our community choir. The vocal groups are headed by Dr. Morris Stevens. These groups perform throughout the school year on and off campus. In March the combined choirs join with the orchestra to perform major works for the Masterworks Concerts. The St. Edward’s University Instrumental Ensembles are open to any and all students wishing to get involved. Our ensembles include Steady (our top jazz big band), Lab Band (our second jazz big band), the Jazz Improv Combo, Mariachi Alas de Oro, Guitar Ensemble and the Thunder Goats (our percussion ensemble). Our instrumental ensembles perform both on campus and off campus, averaging two to three concerts per semester. If you are interested in playing with any of our instrumental ensembles, contact Dr. Joey Colarusso by email at josephcc [at] stedwards.edu or call 512-789-1387. For students seeking admission into one or more of the jazz ensembles, auditions are held on the first two days of the fall semester from 5:00-6:30 upstairs in the Carriage House. An audition sign-up sheet will be posted on Dr. Colarusso’s office door the week before the semester starts. Late auditions can be scheduled by contacting Dr. Colarusso by email at josephcc [at] stedwards.edu or call 512-789-1387. Auditioners should play anything of their choice that shows their skill level, and may be asked to do some sightreading and/or improvising. Auditions are very informal, and take less than ten minutes. Students seeking admission into Mariachi Alas de Oro, Guitar Ensemble or the Thunder Goats do not need to give an audition. December 9- All SEU vocal and instrumental ensembles will be performing at the Festival of Lights Holiday Concert. The Candlelight Concert on the Main Building begins at 6:00PM. Afterward, the Holiday Concert begins at 7:30PM in Mabee Ballroom. The St. Edward’s University Orchestra is open to all students with prior experience playing in band or orchestra. The orchestra also includes SEU faculty and staff as well as guest musicians from the Austin community, creating a full orchestra with seasoned sound. Our concerts have included premiered works, classical favorites, and collaborations with students and faculty and in the visual, literary, and performing arts. We perform both on campus and off campus, averaging two to three concerts per semester. Festival of Lights Concert featuring choirs, jazz bands, mariachi and the orchestra December 7, 2018 in the Mabee Ballroom. 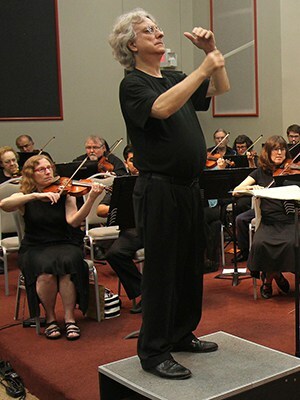 Robert Alan Radmer has been the Music Director of the SEU Orchestra since 2010. Additionally, he is the founder and Music Director of the Balcones Community Orchestra and the Central Texas Medical Orchestra, both in Austin, TX. He has worked with youth orchestras and adult ensembles in six states, and for ten years was Music Director of the Eastern New Mexico University Symphony Orchestra. Radmer’s primary conducting studies were with Gurer Aykal, General Director of the Turkish National Symphony. Radmer attended by invitation the American Academy of Conducting at Aspen (2001) and the Conductor’s Institute at the University of South Carolina (2002), and studied under conductors David Zinman, Murray Sidlin, Robert Spano, Donald Portnoy, Samuel Jones, and Kate Tamarkin. Radmer has performed as a violist with chamber ensembles and orchestras in over two thousand performances since 1981 in 21 states and ten countries. He was awarded the Doctorate in Viola Performance from the University of Southern Mississippi in 1993, and has served on the music faculties of Texas State University, the College of Saint Scholastica, Eastern New Mexico University, and Southwest Texas State University. Radmer was honored by being named Teacher of the Year in 1996 by the American String Teachers Association (New Mexico Chapter). Radmer teaches violin, viola and guitar in his private studio, and in his spare time he is a composer of concert music and is also an active member of the popular music scene in Austin. He also performs and records as a guitarist, singer, songwriter and improvising violist. Rehearsals are Sundays 5:00 PM – 7:00 PM in Jones Auditorium. Please bring your own music stand to rehearsals. Please take very good care of your music, keep it in the folder and return all of it after the concert. Concert attire is dressy ALL black. Gentlemen should wear dress pants and button down dress shirt. Jackets and ties are not required. Ladies may wear dressy slacks or skirt with a blouse or a dress.